MANG.ID is one of the creation of UB FEB students who participated in the Student Creativity Program (PKM) in Application Technology (PKM-T). After passing monitoring evaluation and funding, PKM participants will be competed to Japan and Korea in August. Currently, this MANG.ID guided by Mr. Sigit Pramono S.E M.Sc has worked with the programmer to make the application so that it can be downloaded immediately in the playstore. 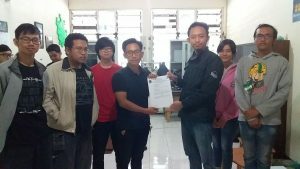 The number of UMKM complaints about the difficulty of promoting, underpinning a team consisting of Yamamo Satrio (FEB), Raditya Hidayat (FEB), Joshua Lagutan Manullang (FEB), Tobing Setyawan (FILKOM), and Junior (FTP) is to establish MANG.ID. MANG.ID will be a promotional container for Small Medium Entreprises (SMEs) who need media to promote their products. MANG.ID is designed in the form of an application is expected to facilitate the SMEs because it does not require a large cost and can be accessed only with the internet network. “Hopefully in the future, MANG.ID able to passes PIMNAS and get investors to fund the implementation of this idea,” said Satrio, one of the team members. Previously this team has also conducted input 100 database of UMKM in Malang, and will be followed by making application by programmer, publication to radio, and uploaded in playstore. This idea is also in line with government programs that are currently rampant to grow the souls of entrepreneurs in society. With this application is expected the entreprenur who are still new can be facilitated well.